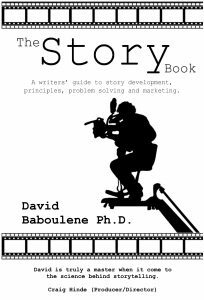 David Baboulene is a highly gifted and strangely beautiful story consultant. Well, I would say that, because I’m writing this web page in the third-person. Seriously, I have provided story consultancy services on dozens of financed feature films, shorts, novels, television productions, the odd play and even one musical. My unique approach to story consultancy, using, for example, knowledge gaps, subtext and storification, means that all comments are justified and explained through objective criteria. My story consultancy services are based on decades of experience and formal research and are as close to a ‘science of story’ as anyone has ever managed. I can work cynically as part of a production team to explain and then maximise the story’s commercial prospects, or work in a more sensitive way, supporting a writer in nurturing their baby. Stories are often intensely personal, and sometimes the problem is not that the story needs ‘fixing’, it is more a matter of helping a writer to deliver the story they imagine. They can no longer see the wood for the trees, and my role as a story consultant is to understand and then capture the integrity of the original inspiration. This is often the most valuable role a story consultant can play, and is why I believe every story should have a story consultant. I am not (necessarily) there to help with the creative writing process, but to understand (and explain) the story’s power and ensure it is captured. Let’s be honest – most people, even professionals in the story industries, do not understand story or know what it is that is working for them in a story they are attracted to. A story consultant can identify that golden nugget that makes it special and gives it a heart. Even once that heartbeat is understood, it needs a champion to ensure it is retained. That is the job of a story consultant. If you are interested in talking to me about working with you on a project, do please get in touch via the Contact page.